Wrong Numbers Can be Fun! 800-123-4567 was not the number to my credit card service. It was 888-123-4567. However, I was informed that I was attractive and that many lovely ladies were waiting to talk to me, so it wasn't a total loss. Wrong numbers can be fun, just ask anyone who does government budgeting. As an aside, I dialed the numbers above and to my surprise, neither are in use. I guess they are 'Too Good'. Man, I gotta score something like that. Wouldn't it be neat to tell someone your number was (area code) 123-4567? It would end those "Hey, I woulda called but I lost your number" conversations. I had repeated failures when I was trying to control someone elses screen using iChat. The message was something similar to 'No Data has been received in the last 10 seconds' and the screen sharing would end after briefly showing the other person's desktop. 3. 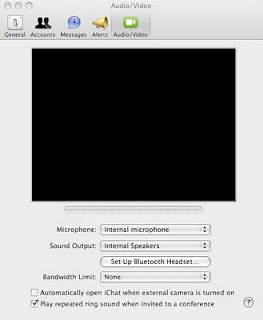 Under Video and Audio Settings in iChat, I had my bandwidth limited to 500Kbps. 4. Having invalid audio and video devices set (like a bluetooth headset not paired or connected). My Money is on #3, but I included the other changes I made during troubleshooting. This was on OS X, chatting between 10.5 and 10.6 OS versions over the internet via an AIM buddy list contact. And it was solved in the manner in that post, namely, killing coreaudiod and restarting iChat. He could hear me, but I couldn't hear him, when a short time before it was working fine. I have no affiliation with this store, but I did buy some of these cases. They work fine, but it took me a few minutes to figure out that a battery installed singly goes to one side, not in the middle of the case. Two batteries fit side by side of course. These are $1.83 as of this writing and let you use AA batteries in equipment that takes D size. Cheap D batteries, in a price and capacity you can choose by purchasing appropriate the appropriate cell. Or you could use AA non-rechargeable from the Mega Pack you got at Costco. Want more capacity? Use two cells. You just need the right form factor, so this is your product. Cons: The lid that holds the batteries in looks a little flimsy. A screw type retention would seem better, but the latch hasn't broken in light use over a few months. If you just install the batteries and leave them (rechargeables don't need to be swapped in and out if your recharger will charge D size) then it should be fine indefinitely. Remember, NiMH cells are 1.2V vs. 1.5V for standard batteries. Your gear may be sensitive to this. Roomba walls for example gripe about the battery being low if the cells are not fully charged.